With 52 minutes on the clock Kerry were six points ahead and looking like they would gather another two points from the lakesiders. They led on a scoreline of Kerry 1-14 to 1-08, but three goals scuppered that result. Kerry had opened brightly with David Griffin pointing within two minutes, Darragh Clinton replied for Westmeath. Five minutes later, Michael Boyle, who was operating at full forward, pulled a ball from the sky, he was fouled and the resultant penalty was struck off the post by his brother Padraig. Padraig was on target with a shot for a point, Robbie Greville was also on target for Westmeath, Alan Devine put Westmeath ahead by one but then Jordan Conway won a free for Shane Conway to convert. Padraig Boyle and Shane Conway added one each before Niall Mitchell reduced the margin to one point. One of the points of the game came from Jack Goulding on 26 minutes when ran onto a ball he lifted it in a flash and drove it over on the turn. Jack had another beauty four minutes earlier, followed by one from Shane Conway while Alan Devine and Niall Mitchell had a point each for Westmeath. On 27 minutes Michael Boyle had a kicked effort saved, but an advantage from the play allowed Shane Conway to point a free. Kerry added two more points before halftime, one from a free and one from Michael O’Leary. At the end of the half, Westmeath managed to manufacture a goal which gave them hope for the second half leaving the halftime score Kerry 0-11 Westmeath 1-06. At the start of the second half Shane Conway and Killian Doyle swapped points. Brandon Barrett replaced David Griffin before Niall Mitchell pointed for Westmeath. Two minutes later, Padraig Boyle slapped the ball in towards Michael, he duly grabbed it and smashed it low to the net, 1-12 to 0-08 at this stage. An injury to Brandon Barrett saw Michael Leane replace him, two more points were added to the Kerry total by Padraig Boyle and Shane Conway putting Kerry six points up. On 56 minutes Martin Stackpoole got his hurley to Shane McGovern’s shot but it ended up in the net and so began the Westmeath comeback. Niall Mitchell and Shane Conway exchanged points before Cormac Boyle batted the ball to the net to level matters. 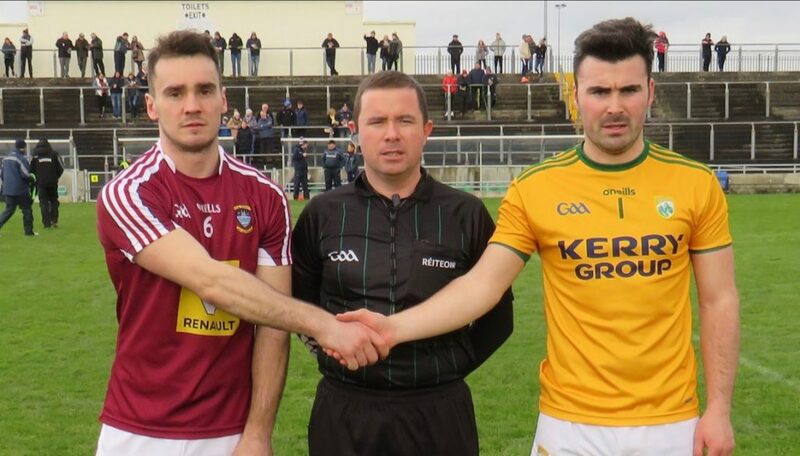 Shane Conway and Paul Greville kept the scoreboard at stalemate on 1-16 to 3-10, but Paul’s brother Robbie put Westmeath ahead when he lobbed Martin Stackpoole who was off his line and Niall Mitchell added another point to leave the score at 65 minutes, Kerry 1-16 Westmeath 4-11. Michael O’Leary, who worked his socks off all day, won a free for Shane Conway to drive over another point. Michael Boyle almost found the net with a low drive from distance, Padraig followed up the shot and put pressure on Paddy Carroll in the Westmeath goal but Paddy got his clearance away. Kerry did manage a goal on 74 minutes when Michael Slattery shot was parried Shane Conway got on the end of it and forced it over the line. Shane was injured in the process but played on. Westmeath added two more points before the end from Killian Doyle and Cormac Doyle. Kerry will rue the missed penalty and their failure to convert their goal scoring chances along with their concession at the other end.